Bring your early to mid summer flower garden to life with Elodie Lilies. These upright-facing double blooms feature lush candy pink petals accented by crimson speckles near the eye. They are crowned by a second layer of curling, twining petals that reveal peeks of their white underside. 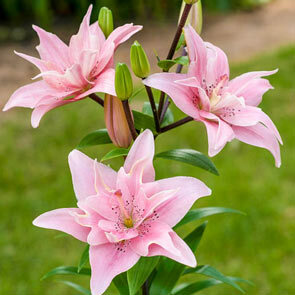 These soft-hued Asiatic lilies (Lilium asiatic) look fantastic when paired with hot pink dianthus or pastel coreopsis. Before the first frost in autumn, bury your Dutch-sourced lily bulbs about 6 inches deep and 9 to 12 inches apart in well drained clay, loamy or sandy soil. Lilies prefer full to partial sun and bloom best with at least six hours of sunshine per day. These Asiatic lily flowers flourish in a hardiness zone between 3 and 8. Elodie lilies can be quite tall, reaching up to 4 feet high, and being perennials, they'll produce more blooms every year. These coveted double Asiatic lilies are pollen free, making them ideal for gardeners with seasonal allergies. Create a season-long lily bed by pairing these midsummer bloomers with late spring Asiatic varieties and late blooming Oriental lilies. Add Canna and Torch lilies for a fantastic midsummer display. 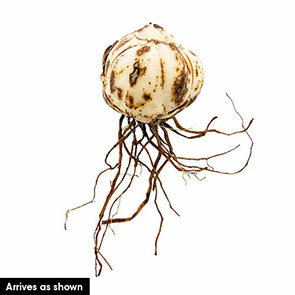 Or make these beauties a focal point in an island surrounded by sun-loving hosta varieties. Celebrate the arrival of summer with gorgeous perennial Elodie lilies. Bring your early to mid summer flower garden to life with Elodie Lilies. These upright-facing double blooms feature lush candy pink petals accented by crimson speckles near the eye. They are crowned by a second layer of curling, twining petals that reveal peeks of their white underside. 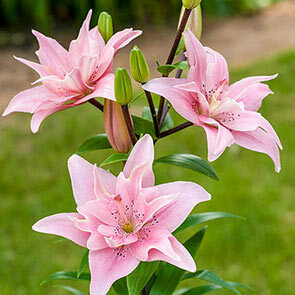 These soft-hued Asiatic lilies look fantastic when paired with hot pink dianthus or pastel coreopsis. Exotic looking and produces no pollen!